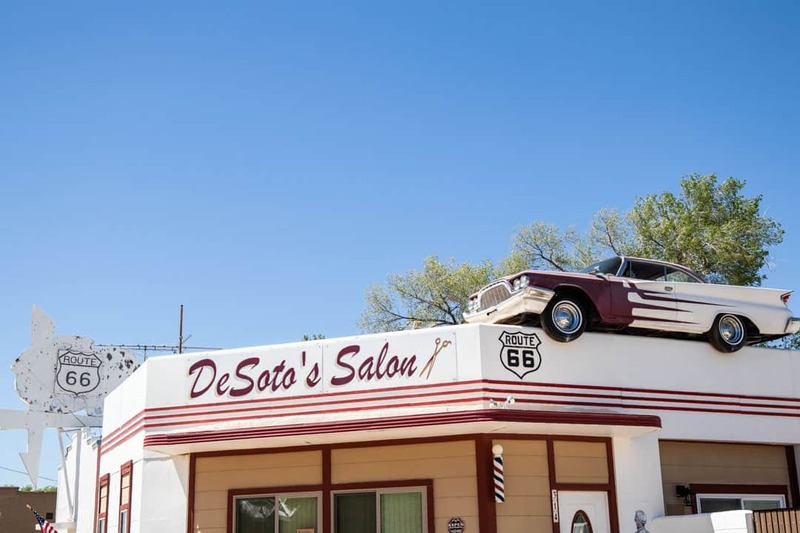 Route 66 is perhaps America’s most famous stretch of highway in its history. 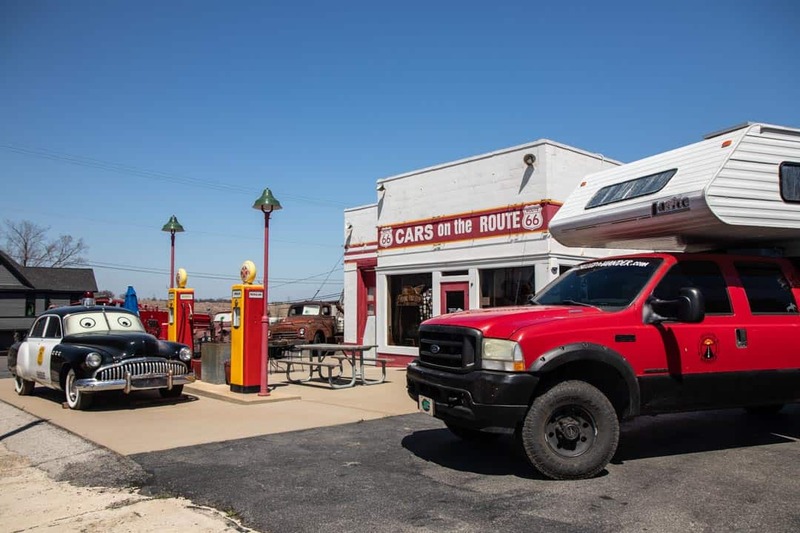 Historic Route 66 runs for over 2,400 miles from Chicago to Los Angeles. First constructed in the mid-1920s, it was a major avenue for Americans and their products on the move. But as time passed it has served various purposes. At it’s inception, the highway catered to the transport of goods from one place to another. The road was built rather irregularly, connecting the dots between one town and another that served as anchor points in the distribution of goods. Farmers could reach vast markets once only localized. The American economy was growing ocean to ocean and Route 66 facilitated the growth. However the Great Depression ushered in new purpose. Route 66 became a migrant pathway west and the hope of finding work. John Steinbeck, in his book The Grapes of Wrath, best laid out the plight of the MidWest working man during the Great Depression. It is estimated that hundreds of thousands of Americans traversed Route 66 in those years searching for hope in California. 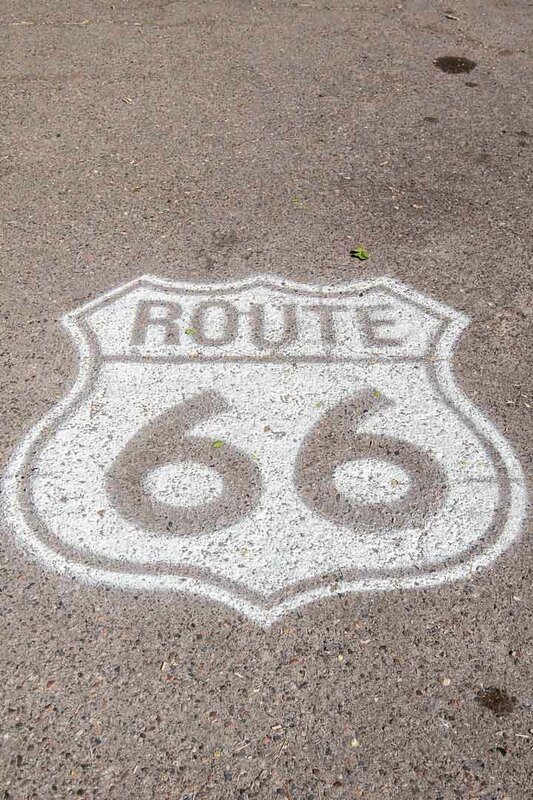 Sometimes you could find road markers like these with the official Route 66 emblem. This makes finding the highway a little bit tricky today! We found ourselves in Springfield, Illinois visiting friends just a few hours away from Chicago. Because it was spring in the MidWest the weather was finicky and we were not certain that we would stick to our initial itinerary. We had hoped to push due west from Illinois into Kansas on our way to several weeks in Colorado. However two late winter/early spring storm systems from the west cut off our path and made our decision to seek the warm, dry climate of the Southwest pretty easy! Thus we accidentally found ourselves on Route 66 from Illinois to Arizona. We can’t claim to have driven the entire route as we missed both Chicago and Los Angeles. However you can see that we had a pretty good time following the route as it meandered through Missouri, Kansas (briefly! ), Oklahoma, Texas, New Mexico and Arizona. If you’d like help getting on the right roads, you can follow our map covering approximately 1,200 miles of the route! You can even have Google send the turn-by-turn directions to your phone! WHAT TO LOOK FOR ALONG THE WAY! 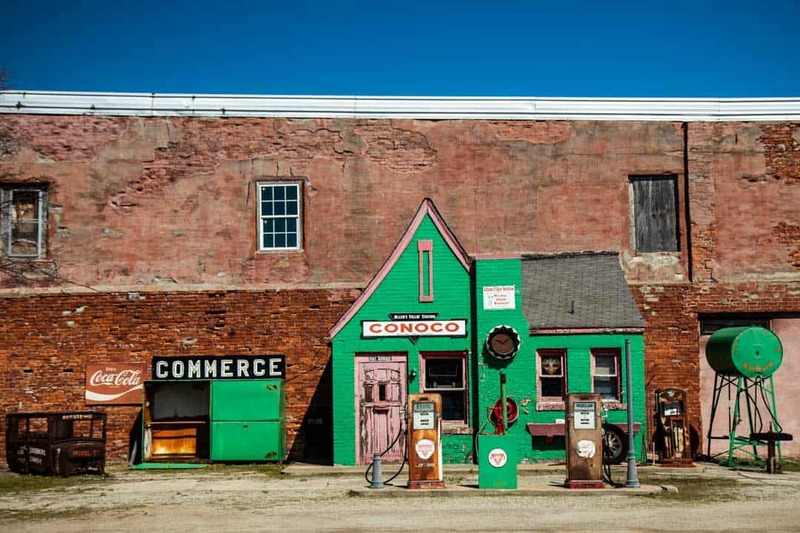 While there are LOTS of places we did not see along our drive of Route 66, these are a few of our favorites. We found they were worth the stop if you happen to find yourself driving Americas most famous stretch of highway! Route 66 Drive-In Theater in Carthage, Missouri. It was opened in 1949 and you can still catch a show on the weekends! 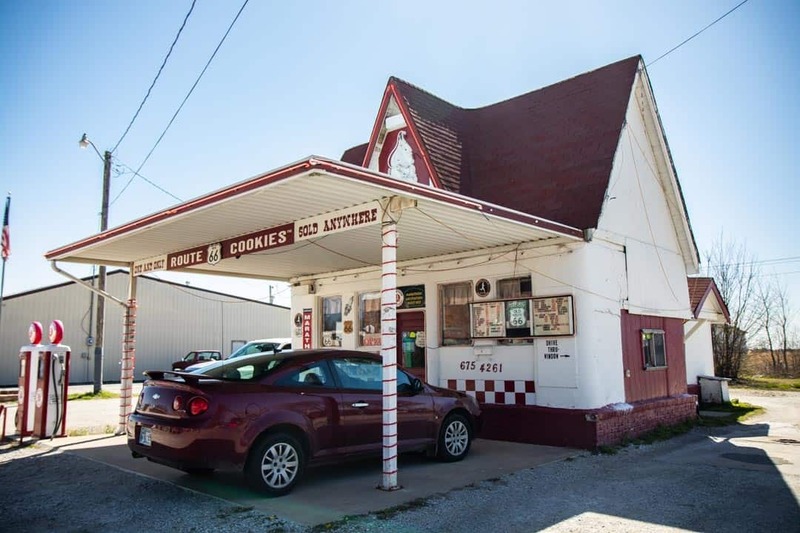 Kansas has a very small, yet bountiful portion of Route 66. It likely has more to see, per mile of highway, than any of the other states. So if you are looking to start somewhere and don’t feel like stretching the trip north into Missouri and Illinois, Galena is a great place to begin! Cars On The Route 66 Gas Station in Galena, KS. 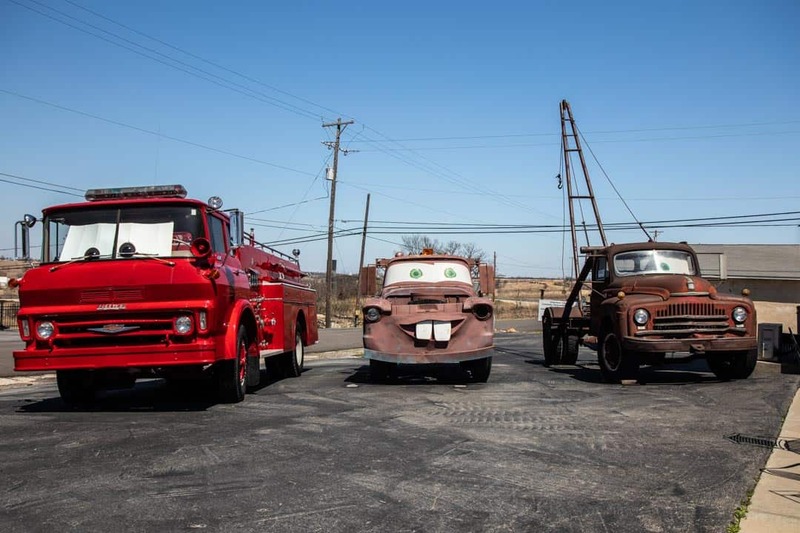 You might recognize Tow Mater from the movie “Cars” as this gas station inspired the fictional character! Our rig didn’t quite fit in to the old look and feel of the gas station in Galena, KS! Oklahoma, as a state, is vast. Thus covering the portion of Route 66 that crosses through Oklahoma can be daunting in itself. Because of the timing of our schedule (and trying to avoid 60 mph winds on the highway!) we missed out on some chunks of the route in Oklahoma. However, we were relieved to find that just driving across Interstate 44 covers much of the old route. When the Interstate was built it absorbed much of the older route. Towns like Commerce, Oklahoma still celebrated their connection with Route 66 on street signs and water towers alike. Dairy King on N. Main St. in Commerce, Oklahoma was originally a service station of the Marathon Gas Company. 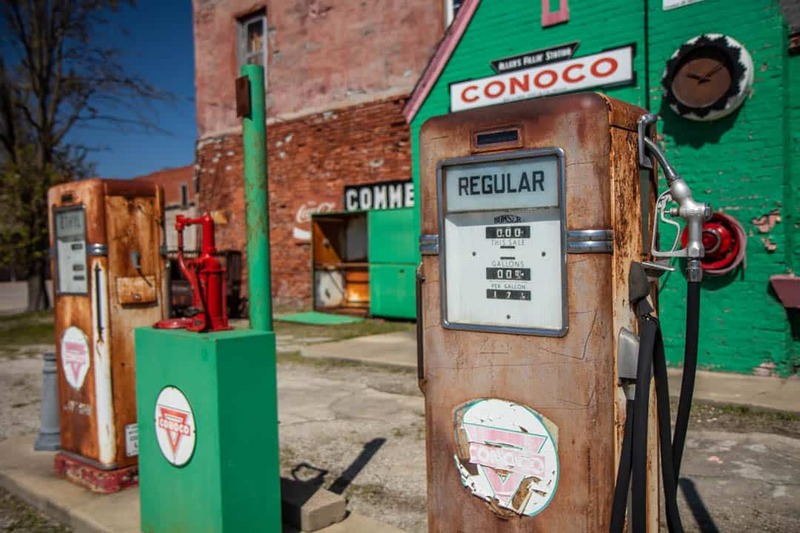 Perhaps one of our favorite stops was this old retro Conoco station built in 1929 into the side of an existing brick building. 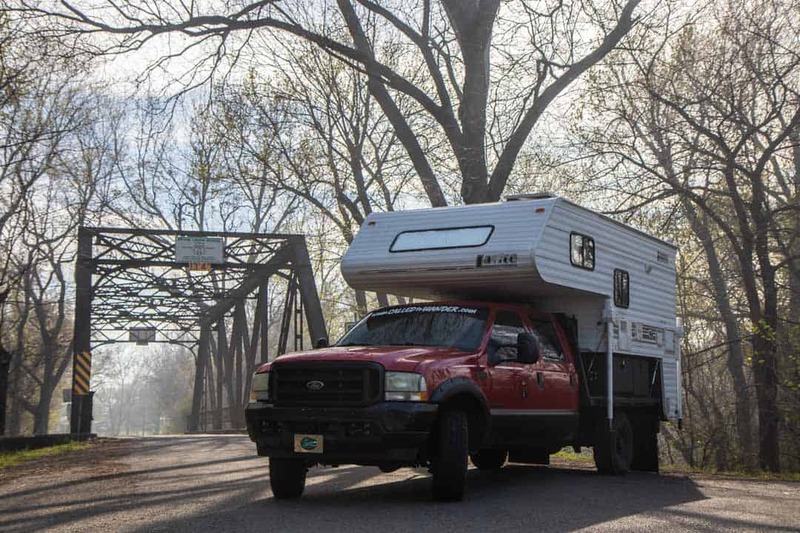 One of our favorite stops was the Pryor Creek Bridge in Chelsea, Oklahoma. We passed by it and Chris saw it from the corner of his eye so we turned around to check it out! Foss Jail Cell sits along Historic Route 66 in Foss, Oklahoma. 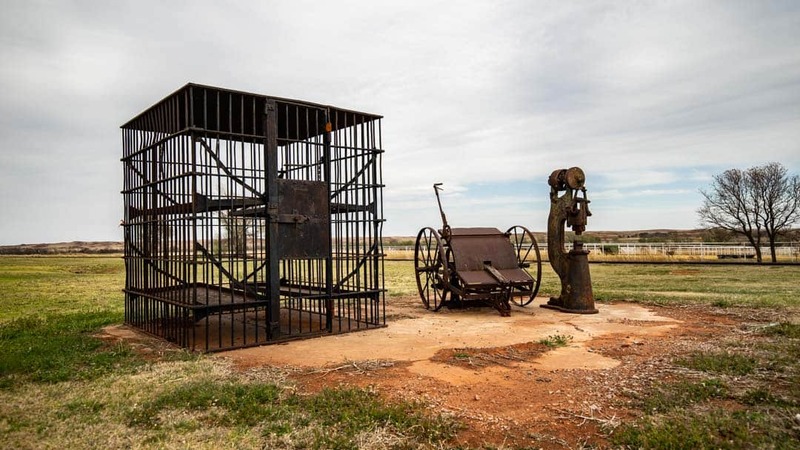 It is a very rare cage cell most commonly used in the Old West because it could be transported as needed from town to town. 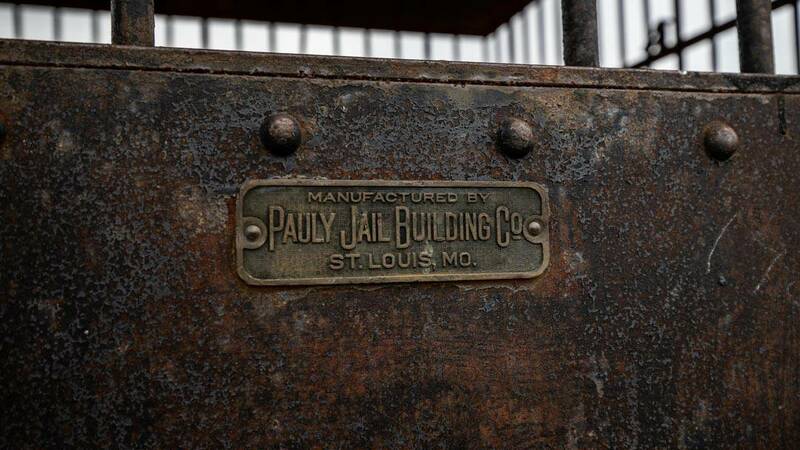 The Foss Jail Cell Was Manufactured by Pauly Jail Building Co. When we arrived in Texas most of the panhandle was on fire. This portion of the state had experienced extreme drought for over six months. The wild fires were so bad that we were actually evacuated from one of our campsites. However a stretch of Route 66 passes through the state and crosses Amarillo. Make sure to let us know if you catch this portion of the highway! New Mexico, like Texas and Oklahoma, is broad! But like Oklahoma, Texas and Arizona Interstate 40 swallowed up most of the original Route 66. So you have to keep an eye out for exits from the Interstate where you can explore the markers in New Mexico. There are a dozen historic stops throughout the state. 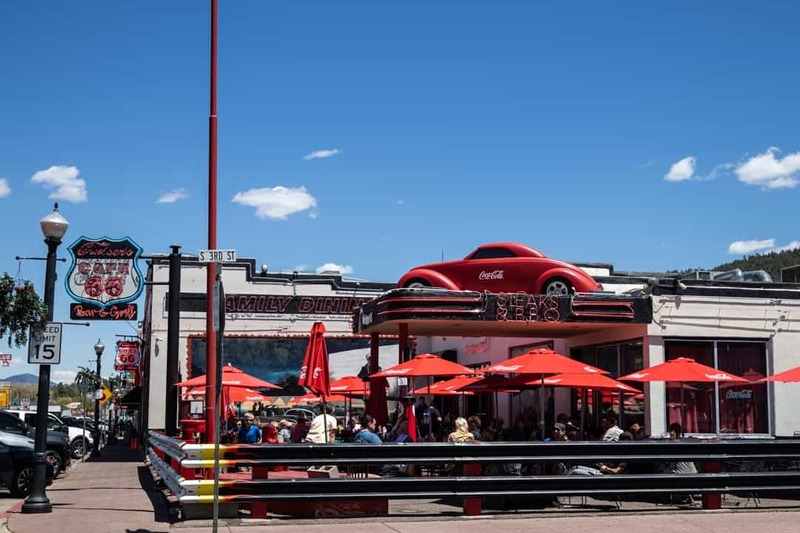 We focused our time in exploring Albuquerque, as a city, and set Route 66 mostly aside for a few days! 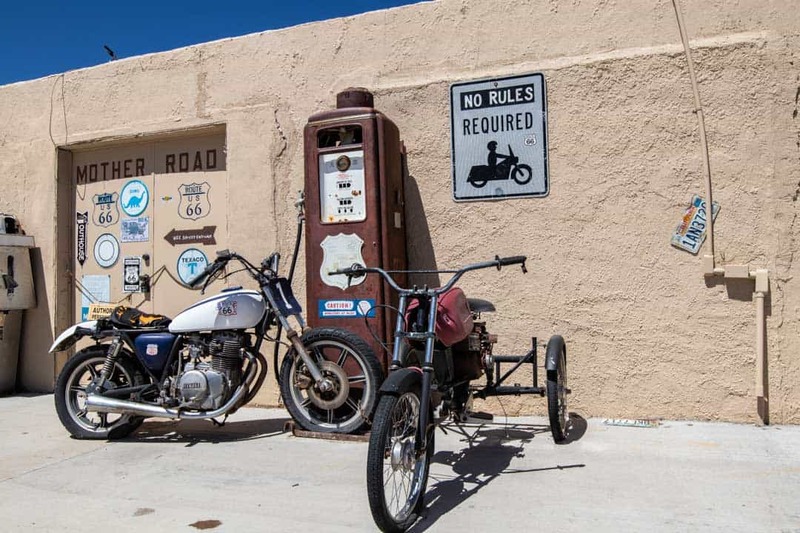 Arizona is chock full of places to see along Route 66! In fact, as a whole, Arizona was our favorite state to stop and enjoy the history of the highway. Like its neighboring states, Interstate 40 was built upon the original highway… in most places. But there are still gems, such as in Seligman, where there is literal pavement left from the original highway just outside the confines of the Interstate. 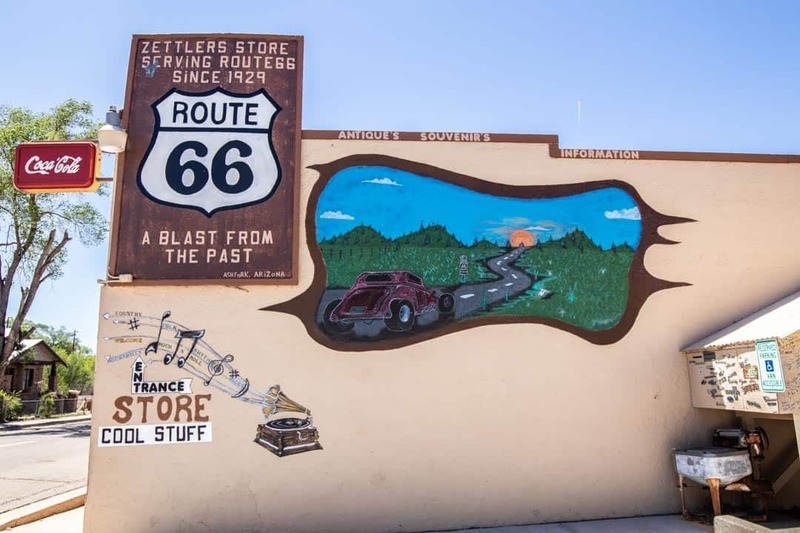 And did you know that both Arizona’s Meteor Crater, Petrified Forest and Painted Desert National Park and the Grand Canyon were on the “official” list of original Route 66 stops? They are all a little ways off from the Interstate. However, visiting them is totally worth it if you’re making the drive! And if you’re a fan of the Eagles, there is an actual street corner in Winslow, Arizona that has been memorialized by the hit song, Take It Easy! 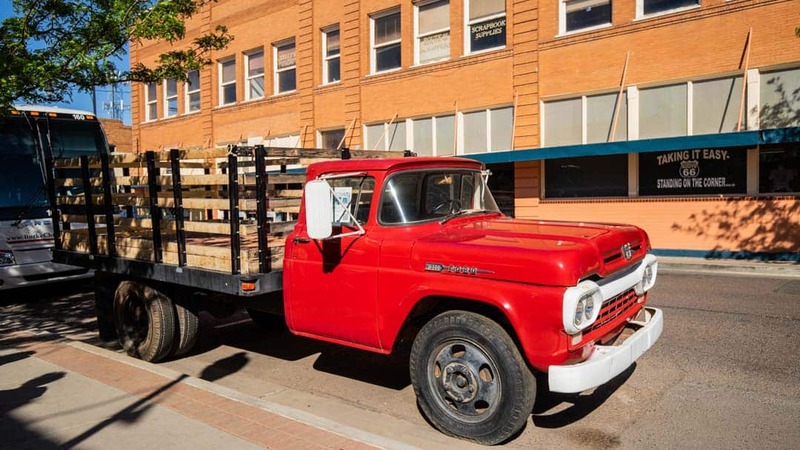 Of course we had to visit since we were both raised on the Eagles AND we drive our own flatbed Ford! 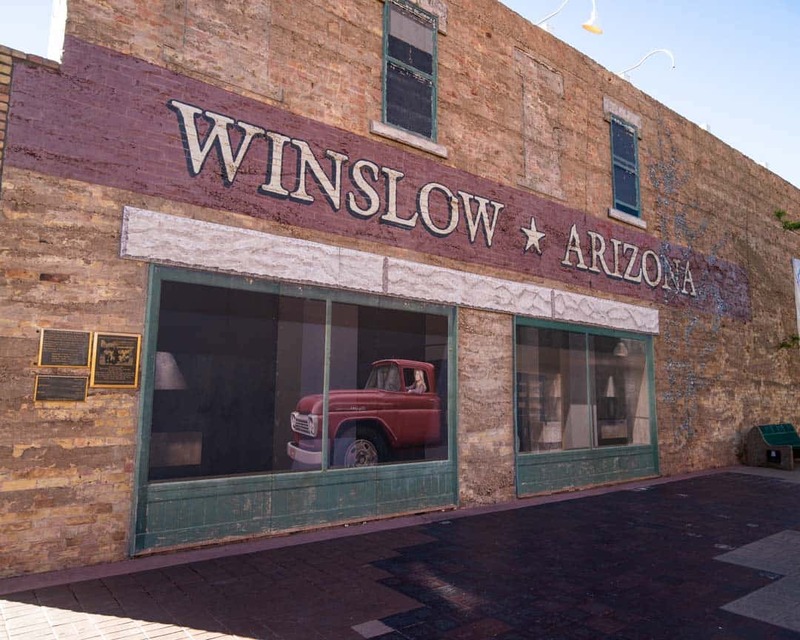 The small town of Winslow, Arizona, was made famous by the Eagles song “Take It Easy”. Historic small town Williams, AZ is considered the gateway to the Grand Canyon. 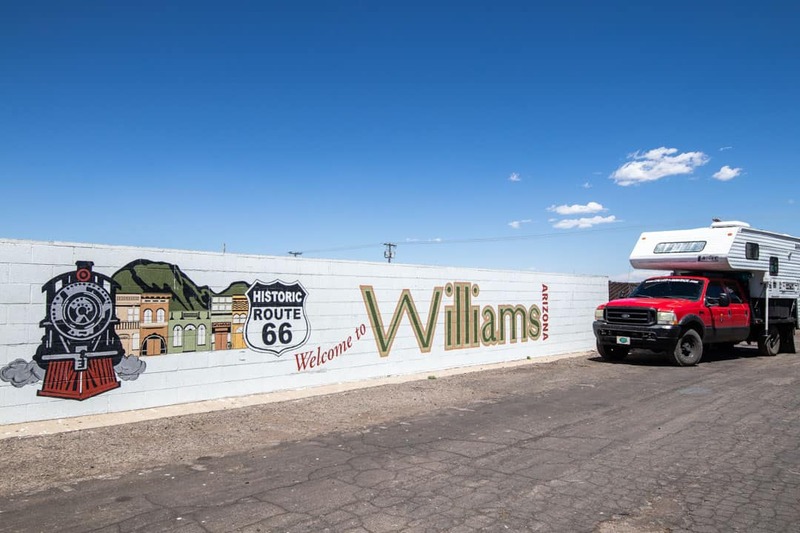 Route 66 Mural in Williams, Arizona. 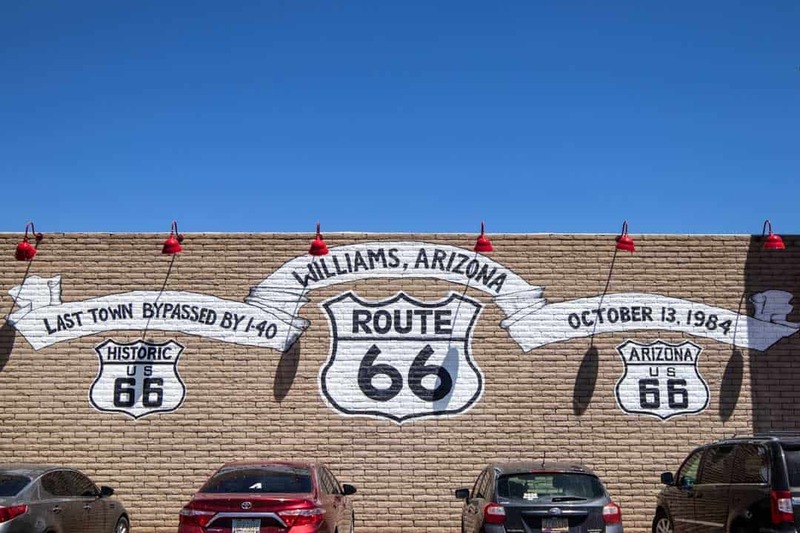 Williams is known as the last Route 66 town that was bypassed by I-40. “Get your kicks” on Historic US 66! 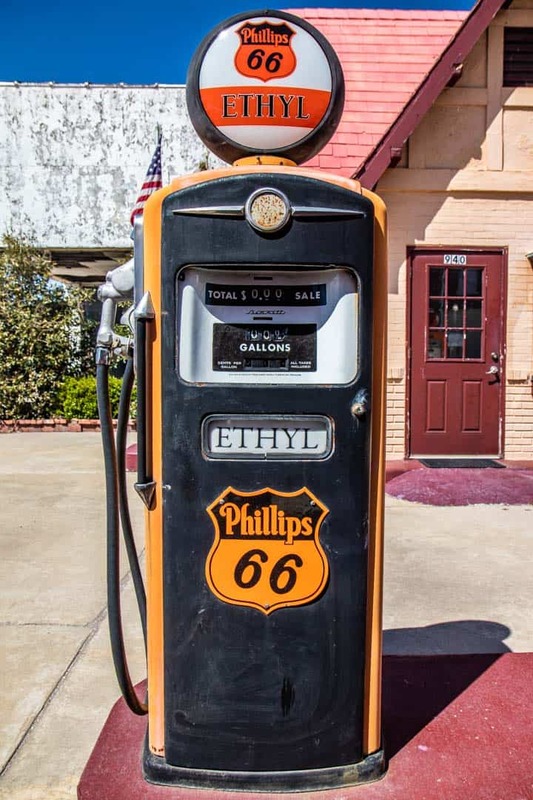 If these weren’t enough to inspire and inform you as you plan your trip, OR if you’d like to try and drive the entire length of Route 66, Trip Savvy has a very thorough list and resources for each area of significance.